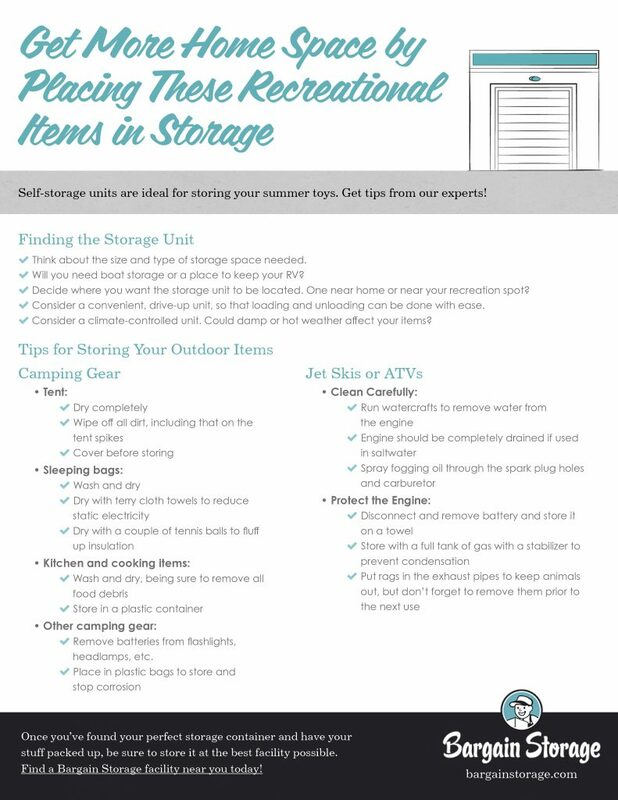 With summer coming to a close, it’s time to think about storing all of the summer gear we used on the water and in the outdoors during the warmer months. While we love our outdoor adventures, the gear they require can sometimes take up more space than we would like in our homes or living areas. And no one wants the cost of getting a bigger place just for gear. For these reasons, summer recreational items are ideal for self-storage. Self-storage units make it possible for active individuals and families to enjoy their seasonal outdoor toys without having to squeeze everything into a garage, backyard, or driveway when the items are not in use. And, since much of this gear represents a significant financial investment, it’s great that a storage space also offers protection from water damage and the elements. Choosing a self-storage unit for recreational items will involve thinking about the size and types of storage space needed, as well as the location. We offer convenient boat storage, RV storage, and self-storage units in many sizes to accommodate all kinds of recreational summer items. We also have dozens of locations to choose from in multiple areas. Some families choose storage facilities near their homes and some choose facilities close to where they go for recreation. Read on for some of our best tips for safely storing summer gear. Tent: Always pitch the tent when you return home to ensure it’s completely dried out. Wipe the dirt and sand off of surfaces, tent spikes, and cover before storing it away. Sleeping bags: Always shake them out and hang them to dry (not in direct sunlight because of the nylon) prior to storage. When possible, washing in a front loading machine is best. In the dryer they do well with some terry cloth towels to reduce static electricity and a couple of tennis balls to fluff up the insulation. Kitchen and cooking items: Give these a good washing and drying before storing them each time. Even small amounts of food residue or crumbs can be a major problem in storage when it comes to bacteria and pests. Once clean and dry, the items should be sealed in a plastic container between trips. Other camping gear: Always remove the batteries from flashlights, headlamps, and radios before storing them. This avoids dangerous corrosion. Just keep them in a plastic bag with the item, so you have them handy for the next trip. Clean Carefully: Any gear of this type should be hand washed and dried completely before storing. For watercrafts, it’s very important to run them for a short time to get all of the water out of the engine. Moisture can wreak havoc on an engine in storage, especially if it gets cold. If used in saltwater, the engine should be completely drained. It is recommended to also spray fogging oil through the spark plug holes and the carburetor. 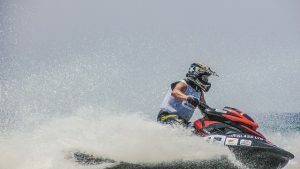 Protect the Engine: Jet Skis and ATVs should be stored with the battery disconnected, removed, and stored on a towel. They should also be put away with a full tank of gas with a stabilizer in it to prevent condensation. Putting rags in the exhaust pipes and ski areas will keep animals out, but don’t forget to remove them when you bring the item out of storage to start it up. ~All items should be cleaned and completely dried before storing. ~ Metal parts may need to be treated with WD-40 to avoid rust or corrosion. ~ Nylon fabrics or pieces can be hung gently or folded away as need (as with hammocks and such). ~ Most items do better when stored upright rather than stacked. With any gear, it’s best to periodically visit the storage space and move things around, shake them out, and clear off the dust to avoid damage to all of the different kinds of materials, including fabrics, plastics, metals, and woods. For guidance on choosing a storage solution, please contact us, and we will gladly help you select the perfect place for your summer recreational gear.